Zoodoo offers an exciting experience and enables all visitors to get up close and personal with amazing creatures. Zoodoo offers all day attractions and access including free rides for kids, safari bus tour, coffee shop, BBQ & picnic facilities. Zoodoo Wildlife Park is located just 6km from the historic township of Richmond. 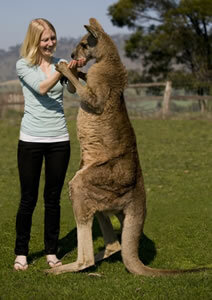 Zoodoo Wildlife Park is located just 6km from historical Richmond and is based on 80 acres of farmland. Originally an ostrich farm and a miniature pony stud, Zoodoo officially opened its doors to the public on the 2nd of July, 1999. Starting off small, with only a handful of native animals, Zoodoo has since become one of the largest wildlife parks in Tasmania. Now offering a large range of native, agricultural and exotic animals, Zoodoo has something for everyone. Zoodoo Wildlife Park is renowned for its hands-on approach which allows you to get closer to some of your favourite animals than you ever thought possible. With the acquisition of Bengal tigers in 2008 and now African lions in 2009 the future looks bright for Zoodoo and its customers. Zoodoo Wildlife Park is committed to giving people the opportunity to appreciate native and exotic wildlife in a setting which is both comfortable for the animal and pleasurable for the customer. Global Ballooning offer Sunrise Balloon Flights over Melbourne and Sunrise Balloon Flights over Yarra Valley, read more on what our biggest ambassadors have to say...our passengers! Being Australia\'s most professional ballooning company Global Ballooning provide passengers with a sustainable adventure experience. All our passengers are VIP and our focus is on our passengers comfort, safety and enjoyment. For more information on why you should look no further read more on Why Global Ballooning? and the Facts about our leading ballooning organisation. 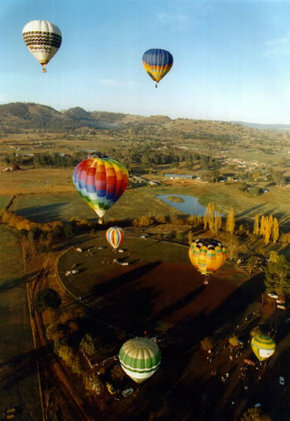 Our company has flown hot air balloons all over Australia, and flies both passenger balloons and Special Shape balloons. Over the past decade, we have developed a successful and professional organisation dedicated to the enjoyment and safety of our passengers, as well as the operational and marketing successes of the clients for whom we fly. Our Wellness Centre is based on the belief that our clients' needs are of the utmost importance. We are committed to meeting those needs. As a result, a high percentage of our business is from repeat clients and referrals. PhonKlai is where ancient eastern treatments combine with western lifestyles. Established in 1984, the gallery represents about thirty contemporary Australian artists, several estates, and a few international artists. 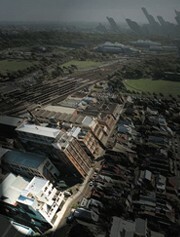 It also holds regular group exhibitions of modern and contemporary Australian art. 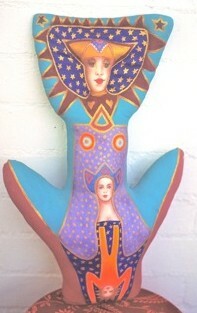 Modern & Contemporary Australian and International Paintings, Sculpture, Works on Paper and Ceramics are represented. Established in 1989, Anita Traverso Gallery represents a portfolio of Australian contemporary artists and designers who are consistently committed to high standards in their expression through their chosen disciplines. Anita Traverso Gallery specialises in artworks and design objects that are provocative, unique and irreplaceable. William Mora Galleries is one of Australia's leading commercial galleries, committed to supporting and exhibiting contemporary Australian art. William Mora Galleries presents monthly exhibitions of emerging and established indigenous and non-indigenous artists and deals in outstanding modern and contemporary Australian art. 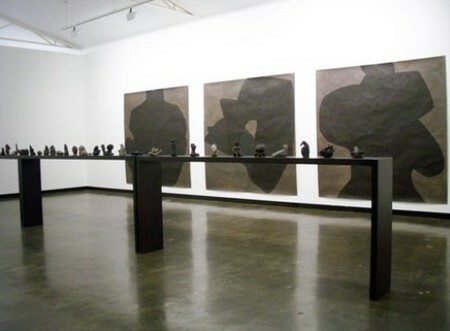 The artists represented by the gallery work in a range of techniques, including painting, installation, printmaking, photography and sculpture. After more than a decade in Flinders Lane, William Mora Galleries relocated in early 2000 to an exciting new gallery complex in Tanner Street, Richmond, the first purpose-built contemporary art space in Melbourne for many years. The new complex combines exhibition and viewing galleries with a residence for William Mora and his family, and a studio for his mother, prominent Australian artist Mirka Mora. Designed by young Melbourne architect Chris de Campo, the complex allows William Mora Galleries to offer a more flexible and relaxed environment in which to encounter works of art. Niagara Galleries is committed to the exhibition and sale of the finest modern and contemporary Australian art. The gallery has a stable of leading figurative and abstract painters, sculptors, photographers and ceramicists and for several years supported young talent through an annual, independently - curated exhibition of emerging artists. Also on the calendar every March, is the Blue Chip Collectors’ Exhibition, which presents the works of, acknowledged masters such as Fairweather, Beckett, Tuckson, Brack and Perceval. Through this exhibition and ongoing active dealing in the secondary art market, Director, William Nuttall, has developed an extensive personal network of collectors. Vendors can be assured of genuine appraisal, targeted marketing and individual attention by William for works offered on consignment through Niagara Galleries. 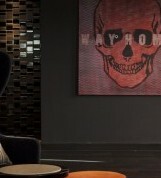 The gallery also provides a specialized art consultancy service for both individuals and corporations. William and his staff can advise on all aspects of establishing and maintaining an interesting and rewarding art collection - no matter what size or budget. They are happy to arrange on-site consultations to assist with the best selection and placement of works. Objective viewing of works and commission bidding at auction are also available. William Nuttall is also an active member of the Australian Commercial Galleries Association and an approved valuer under the Cultural Gifts Programme. Niagara’s newly renovated premises offer one of the most exciting and extensive stock rooms in Melbourne and private viewings are available by appointment. Our ever growing archive consists of 20,000+ slides, documentation folders, books, journals and catalogues which document images and writings of over 200 Australian women artists. The collection represents a broad range of art styles from various eras in a diverse range of media and art disciplines including craft, design, photography and installation. Sylvia Convey is one of Australia's most distinctive outsider artists. She was born in a refugee camp Itzehoe near Hamburg Germany in 1948. With her Lativan parents and elder sister she sailed to Australia on the Skaugum in early 1950. They were part of the first wave of immigrants to arrive in Australia after World War II. This group of displaced persons' had a profound effect on what was then an Anglo Celtic monoculture. From her childhood Sylvia had the gift of being able to transmute her joys and sorrows into poetic images which have the power to enchant and disturb. A true outsider artist her images are derived from her own day to day and oneiric experiences. Intuitively she has tapped the richness of her ancestral heritage which adds a decorative radiance to her images. An engaging eroticism is also a dominant theme in her work. Start flexing your calves and pulling up your sweat bands – there are some seriously worthy stairs to clamber. Block Projects have filled the innards of the Block Arcade with a conceptual exhibition space designed for artists, hand picked by a team of fervent curators. These creative sorts have built the gallery upon the philosophy of providing a platform for fresh talent to exhibit in a commercially viable environment. In a field which pays much attention to highly established artists, this may be otherwise challenging. If you seek higher ground, request a peek at the rooftop space where launch parties unfold. 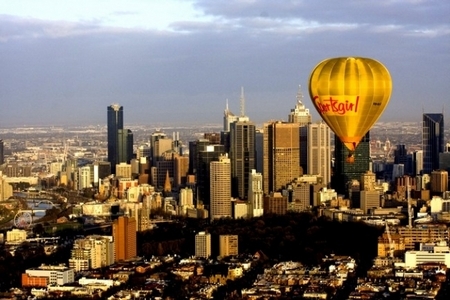 Here you can view Melbourne from a peculiar angle. Abandoned buildings and tight laneways viewed from a birds-eye perspective are a reminder that secrets can still be discovered in this town. Block Projects currently features the work of Jordan Snedding.The orchestrated layers of oil on canvas create an infinite regress of colour and prove a genuine creative workmanship. This one is well worth the stairs. Representing contemporary Australian artists Nicholas Harding, Kirra Jamison, John Nicholson, Selina Ou, Matthew Sleeth, Judith Wright and Michael Zavros. Extensive stockroom including Ian Fairweather, Sam Atyeo, Grace Cossington-Smith and others. Paradise Hills is Melbourne’s newest artist run gallery providing an experimental space for emerging and established artists, as well as curators, to explore adventurous avenues of creativity in contemporary art. The gallery is located in Richmond at 1-9 Doonside St. Access from the city is easy, just a short tram ride along Victoria St or Bridge Rd to Burnley St. The gallery is located just behind IKEA Richmond. Google Maps will explain all! 29 August 2011 | Melanie Flynn, a former gallery manager at Karen Woodbury Gallery, is opening a new project space in Richmond, Melbourne. 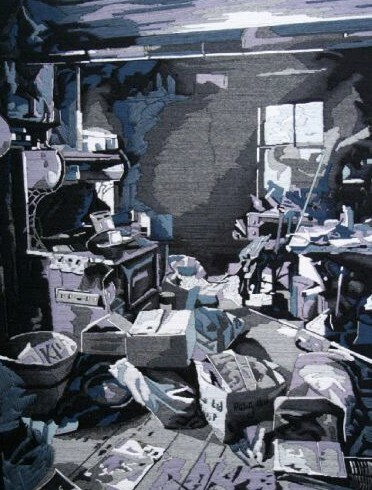 Called Lowrise Projects, the gallery will open on 9 September 2011 with an exhibition of embroidery works by Adelaide artist Sera Waters. Flynn, together with her partner Jeremy Smart, also runs a company called Artsphere, which builds websites for artists. They were looking for an office space for the company when they came across a small warehouse space in Richmond. Flynn, who has 10 years’ experience in the visual arts, immediately saw the potential. She hopes the small scale of the 30 square metre space will give artists the freedom to be more experimental and innovative without the burden of having to fill a large venue. The gallery will not represent artists but instead work on a project-to-project basis. Most will be emerging artists. ensure our value client receive best service as possible. Since its formation in the 1920s, Hoyts has been associated with countless successful innovations in the film exhibition industry and today Hoyts operates over 350 screens in the oceanic region, consolidating its place among the top three major exhibitors. With showcase cinemas at Fox Studios and Chatswood in Sydney, Chadstone and Melbourne Central in Victoria and Carousel in Perth, Hoyts continues to set high standards in cinematic excellence and offers its patrons a wide variety of customised viewing experiences including Cinema Paris, La Premiere and Directors Suite screenings. Hoyts Victoria Gardens is centrally located above the food court in the Victoria Gardens shopping centre. Hoyts Victoria Gardens has 9 screens, an opulent La Premiere lounge and an exclusive directors suite cinema. Go to Hoyts Victoria Gardens La Premiere for a luxurious cinema experience, featuring unobstructed views from custom made seats, full gourmet menu with in-cinema service and complimentary popcorn and soft drink to complete the experience. The ultimate cinema experience, visit Hoyts Victoria Gardens Directors Suite - With a dedicated concierge team, you can relax and enjoy a private bar complete with cocktail and reserve wine list plus a tempting menu selection. Experience the latest blockbusters from your luxurious recliners in an intimate theatrette with state-of-the-art audio visual technology for a stunning cinema experience. 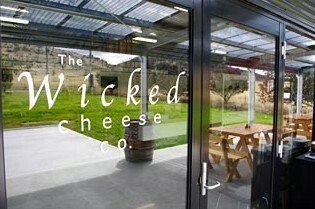 Wicked Cheese are boutique cheesemakers based in Richmond, southern Tasmania. Wicked Cheese has emerged, in a few short years, to gain recognition as one of the most impressive, high quality, hand-made cheese ranges in Australia. Wicked Cheese Triple Cream Brie was awarded the Supreme Cheese Champion Trophy at the 2008 Royal Melbourne Show, and Wicked Cheese Brie was awarded the trophy for Best White Mould Cheese at the 2010 Australian Grand Dairy Awards. You can sample the Wicked Cheese and Richmond Cheese ranges at the factory outlet. There you can meet the man behind the product - Ashley McCoy, the hands-on owner of the Wicked Cheese Company. Ashley McCoy is highly experienced and qualified, and he meticulously attends to his craft. He uses only the purest hormone-free and chemical-free milk from grass-fed cows. Richmond is a 26 minute drive (26 kilometres/16 miles) North of Hobart. 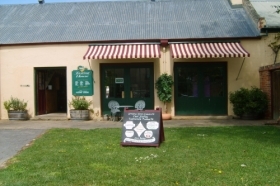 Richmond Tasting House is situated in the historic Richmond, in Tasmania's south. Richmond Tasting House was established in 2001 in the heart of Richmond Village and offers Tasmanian produce, regional wines and whisky's. We offer a large selection of gourmet Tasmanian products including Tasmanian produce, Coal River Valley regional award winning and boutique wines, locally distilled whisky including liqueurs, vodka, gin and a fantastic selection of fruit wines and liqueurs. We can provide you wine and whisky tastings for a small cost and there is always produce available for tasting free. We also own and operate Coal River Valley Wine Tours and offer flexible itineraries for groups of two or more for half or full day tours. Ask us about free membership to our Coal River Valley Food and Wine Club. Benefits include receiving information about new vintages, updates on vineyards, six monthly deliveries of Tasmanian wines and food and discounts on additional purchases. Richmond is a 27 minute drive (26 kilometre / 16 mile ) drive north-east of Hobart. Puddleduck Vineyard is a small family owned vineyard in the Coal River Valley near Hobart. The owners extend a warm invitation for you to visit their vineyard as well as their relaxed and friendly cellar door. Come and enjoy a sit-down tasting of the current releases and local cheeses while watching the ducks puddling on the dam, or bring a picnic lunch to have on the veranda with a glass of medal winning wine. If time is pressing a tasting at the solid Huon Pine bar might be more to your liking. Puddleduck Vineyard currently produce Sauvignon Blanc, Riesling, Bubbleduck, Chardonnay, Rose, Pinot Noir and Cabernet Merlot. - Wines are hand crafted using the traditional methods of hand harvesting and pruning as we know that good wine is made in the vineyard. Meet Bazil our famous Corgi dog who was named "Vineyard Dog of the Year" for Tasmania. He will probably greet you in the car park on arrival. Puddleduck wines are available exclusively from the cellar door or mail order, so don't miss the opportunity to taste them while in the area. 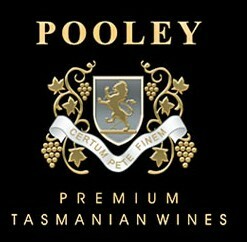 Pooley Wines has two vineyards in Tasmania, and a cellar door in Richmond, southern Tasmania. Cooinda Vale Estate Vineyard is situated 12 kilometres north of Richmond providing the ideal environment for growing premium cool climate grape varieties. Belmont Vineyard cellar door is situated in a stately two storey georgian house buit in the 1830's. We extend our family hospitality to enjoy our elegant, long living Rieslings and intensely flavoured Pinot Noirs at our cellar door facility at Belmont Vineyard. Open most days from 1000-1700, or by appointment. 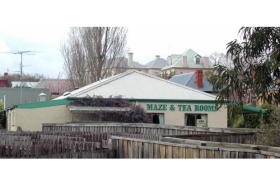 The Richmond Maze and Tearooms is a timber maze at Richmond, south east Tasmania. 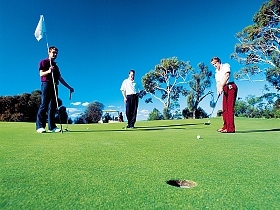 Richmond is a 30-minute drive (27 kilometres/17 miles) north east of Hobart and 20 minutes from the Hobart airport. At the Richmond Maze you can experience the fun of getting lost in a tangle of pathways and dead ends. Try you luck in the two mazes and look for the surprise centre before relaxing with a hot pot of tea, tasty snack or light meal in the tearooms or gardens. This is family fun, suitable for all ages. Richmond is an historic village famous for its Georgian architecture. Discover the convict history of the town, browse the galleries and shops or relax in a cafe or restaurant. Visit the Richmond Gaol and Richmond Bridge - Australia's oldest - or take a horse-drawn carriage ride through town. Richmond is located in the Coal River Valley, one of Tasmania's wine-producing areas. You can take a drive through the countryside and taste some of Tasmania's fine cool climate wines at the cellar door. GlenAyr Vineyard is located in south east Tasmania's Coal River Valley wine region. The vineyard is close to the historic village of Richmond, a 20-minute drive from Hobart (26 kilometres/16 miles). Glen Ayr's two-hectare (five-acre) vineyard produces chardonnay, pinot noir, riesling, shiraz, cabernet and merlot grapes. You can make an appointment to visit the vineyard and taste wines from the GlenAyr range, including pinot noir, chardonnay, riesling and a rare Tasmanian blend of shiraz, cabernet and merlot. The most recent addition to the range is a vintage pinot noir chardonnay. The GlenAyr vineyard was planted in 1975, the second to be established in the Coal River Valley. The reliability and quality of the fruit grown at GlenAyr led to the first major commercial planting in the Coal River Valley district in 1988, with fourteen hectares of Chardonnay and Pinot Noir vines planted at the neighbouring Tolpuddle vineyard. Another six hectares has since been added. Oak Lodge is an historic house in the Georgian village of Richmond, south east Tasmania. Richmond is a 30 minutes drive north east of Hobart (27 kilometres/17 miles) and 20 minutes from the Hobart airport. 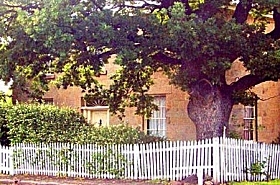 Built between 1831 and 1842, Oak Lodge is a fine two-storey Georgian home originally built as a gentleman's town residence. 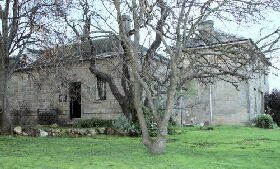 The Lodge's first owner was Henry Buscombe - one of south east Tasmania's pioneering settlers and the brother of James Buscombe who built Richmond's Prospect House. Oak Lodge has been used as a rectory, school, and family home and was once the local doctor's surgery - occupied by the town's noted, American-born doctor, William Clark. The property now houses the Coal River Valley Historical Society. You can visit this National Trust-listed property to gain insight into early colonial life, explore the well-preserved rooms and stroll in the original nineteenth century garden. Oak Lodge is open daily (except Christmas Day, Boxing Day and Good Friday) from 11:30am until 3:30pm. Entry is by gold coin donation and is free to National Trust members. Richmond Park Boat House, on the Coal River, South East of Hobart, Tasmanian unique experience to boat, bicycle and eat. 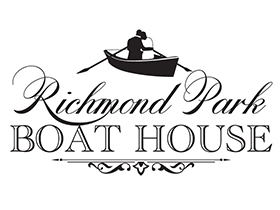 It is the first attraction offering fine Tasmanian foods and wine in a row boat on the water, restaurant on the river. The farm gate gourmet picnic produce menu varies, wine and cheese, BBQ's, Tasmanian Berries and Ice cream, Tasmanian Seafood and luncheons can also be enjoyed beside the river bank or at a local vineyard. You can also experience boutique Tasmanian beer, champagnes or wines from the local cellar doors. Tour the village, explore the heritage, ride to a Coal Valley vineyard on our vintage picnic bicycles. Shop the Art, Craft and Antiques of Australia's finest Georgian village, part of the convict trail tour, which continues to Port Arthur. Unique to Australia, found only in Tasmania our Swan Paddle boats for the young at heart, and wooden boats for the romantic at heart. You can visit the Boat House and restaurant on the river which are open every day, hiring out boats and bikes, picnics are served all day with options for evening bookings. Visit our website to discover the Stretch Limousine half day and full day tour packages. The Tolpuddle Vineyard is located in southeast Tasmania's Coal River Valley wine region. The vineyard is close to the historic village of Richmond, a 20-minute drive from Hobart (26 kilometres). 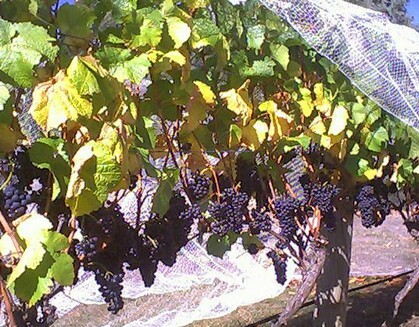 The 20-hectare (50 acre) vineyard produces premium pinot noir and chardonnay grapes. Tolpuddle resources some of the country's best wines, including Eileen Hardy chardonnay and Penfolds Yattarna chardonnay. Tolpuddle is also a key contributor to the Hardy Wine Company's Bay of Fires and Tigress range and the acclaimed Domaine Chandon Tasmanian Vintage Cuvee is made exclusively from Tolpuddle fruit. Tolpuddle also contributes fruit to its own wine label, Glenayr. Glenayr wines include pinot noir, chardonnay, small quantities of riesling and a rare Tasmanian blend of shiraz, cabernet and merlot. The most recent addition to the range is a vintage pinot noir chardonnay. Established in 1988, Tolpuddle Vineyard was named after the Tolpuddle martyrs - a group of British farm labourers who were transported to Australia after attempting to form a union. Their leader, George Loveless, once occupied a cottage at Strath Ayr farm, now the home of Glenayr wines. In 2006, the Tolpuddle Vineyard won the Royal Agricultural Society of Tasmania's inaugural Tasmanian Vineyard of the Year Award. Palmara Vineyard is a boutique winery at Richmond, in Tasmania's Coal River Valley wine region. Richmond is a 30-minute drive northeast of Hobart (26 kilometres). Palmara specialises in small quantities of fine wine. At just one hectare (2.5 acres), it is possibly the smallest commercial vineyard and winemaking operation in Tasmania. Palmara's range of soft, fruity wines include chardonnay, cabernet sauvignon, pinot noir and a unique, blended white 'montage'. 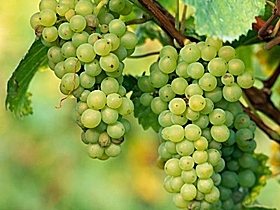 There is also the widely acclaimed Palmara Exotica, an aromatic, varietal wine made from cold climate seigerrebe grapes. Palmara's small production ensures a selection of individually crafted wines, all grown and vintaged on-site. You can sample the range of premium cool climate wines at Palmara's intimate cellar door. Wines are available for sale exclusively at the vineyard and in selected restaurants. Grannie Rhodes' Cottage presents "Turn the key of Time", a live performance at Richmond, southeast Tasmania. This 50 minute fascinating professional performance retells Grannie's true stories. Be transported back to Old England in 1824. Hear of the tribulations of her parents, her two marriages - first to a convict, and then a free man - and discover not only how Grannie lived in this tiny cottage, raising her eleven grandchildren, but also the strange stories involved in the restoration project of the cottage including that of the discovery of the dynamite. 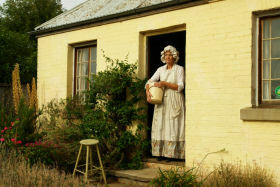 Grannie Rhodes' Cottage is the only remaining dwelling in Richmond without electricity or water. You can discover what life was like for early colonial and convict settlers in Tasmania as you experience the Bark Hut and see Bernie Tarr's wonderful sculpture celebrating those brave early women who came to join their convict husbands. Become part of this extraordinary experience available at 3:00pm or 6:00pm daily, except Tuesdays, or by prior arrangement. Bookings are recommended to avoid disappointment. Show is discounted with a stay at Mulberry Cottage Unique Accommodation on site. Richmond is around 30 minutes' drive (26 kilometres/16 miles) northeast of Hobart. The Old Hobart Town Model Village, in Richmond, is a model replica of Hobart in 1820. You can see how the sailors, officers, free settlers and convicts of colonial Hobart Town lived and learn about this fascinating chapter in Hobart's and Tasmania's early history. Constructed from original plans and maps by owner-operators John and Andrew Quick, this authentic model village is made up of over 60 historic Hobart buildings and 400 period figurines. Translations are available in four languages and umbrellas can be provided in rain or shine. When travelling the Overlanders Way, between Townsville and Mount Isa, the Jack Brown Lions Park at Richmond presents itself as a halfway stopover with a difference. Beautiful shade trees and lush green lawns make it the ideal break for travellers. Good clean toilet facilities are available, along with picnic tables and ample parking especially for caravans. Here you can see Moon Rocks of all shapes and sizes and reflect at the war memorial. ANZAC ceremonies invariably close with the words 'Lest we forget'. 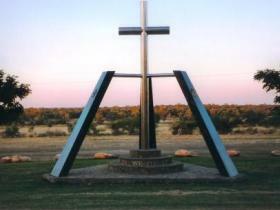 In the outback town of Richmond, a memorial to those who fought in WWI was dedicated on 25 April 2001. The Richmond war memorial is a unique monument: a steel crucifix stands supported by three stylised rifles, marking the graves of three ANZAC soldiers who died in the bloodiest of WWI battles, at the Somme in France during 1916. About 1 million soldiers, British, Australian, French and German, died during five months of battle over 12 kilometres of ground. Australia's loss of 60,000 young men throughout the Great War led to an unprecedented outpouring of grief, the birth of the ANZAC tradition of mateship, loyalty and courage, and the emergence of public monuments honouring the volunteer recruits who went to fight for the British Empire. Richmond's memorial includes rolls of honour for individuals from the region who served and died in WWI and subsequent international conflicts. Jack Browns Lions Park is also home to a memorial to Lieutenant Colonel Henty William Murray VC, described as the most decorated infantry soldier of the British Empire during WWI. He lived at Glenlyon Station, Richmond from 1928 until his death in 1966. Richmond is home to the Award winning Kronosaurus Korner. Inside Kronosaurus Korner you'll find the only centre in Australia primarily dedicated to displaying marine reptiles, as well as a very special dinosaur. Minmi, with impressions of its fossilised skin, is considered to be Australia's best-preserved dinosaur skeleton. The Richmond Pliosaur here is Australia's best vertebrate fossil, and one of the world's best skeleton fossils. The centre is home to over 400 fossil specimens dating back to the Cretaceous Period, 98 - 114 million years ago, when Richmond was part of the inland sea. Don't miss the themed theatrette and hand-held audio guides which are available for self-paced and self-guided tours. 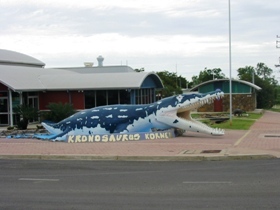 If you find that you're infected with fossil fever after visiting Kronosaurus Korner, grab a map to guide you through the region's designated fossicking site. The friendly staff will be happy to identify your finds. Relax in the Moon Rock Cafe and enjoy a meal or light refreshment and buy a souvenir to remind you of your visit. Kronosaurus Korner has to be seen to be believed! Lake Fred Tritton is conveniently located at the edge of Richmond. 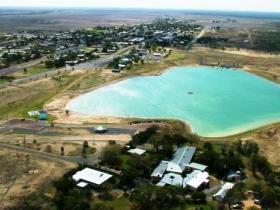 With a 1.2 kilometre circumference and a maximum depth of eight metres, the lake allows visitors and locals the opportunity to enjoy a wide range of water sports. The lake is stocked with a variety of fish including: barramundi, gulf grunter, sleepy cod, spangled perch, yellow fin, freshwater prawns and redclaw crayfish - making it an ideal stopover during the long journey to the Gulf. So why not break the drive, spend a night or two, and wet your line at Lake Fred Tritton. The Tolpuddle Vineyard is located in southeast Tasmania's Coal River Valley wine region. The vineyard is close to the historic village of Richmond, a 20-minute drive from Hobart (26 kilometres). 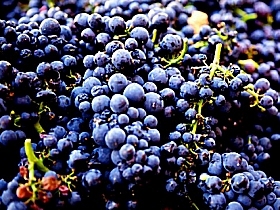 The 20-hectare (50 acre) vineyard produces premium pinot noir and chardonnay grapes. Tolpuddle resources some of the country's best wines, including Eileen Hardy chardonnay and Penfolds Yattarna chardonnay. Tolpuddle is also a key contributor to the Hardy Wine Company's Bay of Fires and Tigress range and the acclaimed Domaine Chandon Tasmanian Vintage Cuvee is made exclusively from Tolpuddle fruit. Tolpuddle also contributes fruit to its own wine label, Glenayr. Glenayr wines include pinot noir, chardonnay, small quantities of riesling and a rare Tasmanian blend of Shiraz, Cabernet and Merlot. The most recent addition to the range is a vintage Pinot Noir Chardonnay.. Established in 1988, Tolpuddle Vineyard was named after the Tolpuddle martyrs - a group of British farm labourers who were transported to Australia after attempting to form a union. Their leader, George Loveless, once occupied a cottage at Strath Ayr farm, now the home of Glenayr wines.. In 2006, the Tolpuddle Vineyard won the Royal Agricultural Society of Tasmania's inaugural Tasmanian Vineyard of the Year Award. 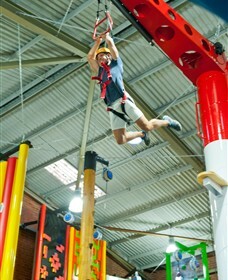 Clip 'N Climb is Melbourne's most exciting and exhilarating indoor climbing attraction. With 33 unique and colourful climbing challenges, each requiring different skill and agility, Clip 'N Climb offers unlimited fun and adrenaline for all ages that love to climb. Clip 'N Climb use climbing harnesses with an automatic belay system (Trublue), helping the climber ascend with ease and providing a safe gentle descent back down to the ground. Unlike other climbing centres no belaying buddy is required. Trublue is the only auto belay device that meets the highest worldwide standards for climbing devices. 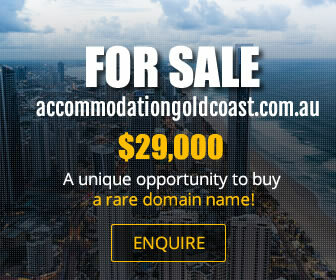 Conveniently located in Richmond, it is close to public transport and free on-site parking is available. There is also a caf� offering tasty real food and drinks, Wi-Fi and well equipped private function rooms for birthday parties, team building and social, corporate, sporting and community groups. Challenge yourself to conquer new heights, improve your speed and master new climbs each time you visit. Unlimited fun awaits. 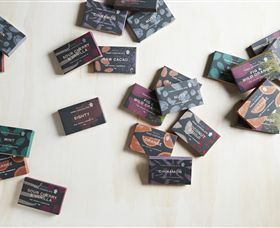 Pana Chocolate is Melbourne's premier provider of handmade raw chocolate crafted with organic ingredients, natural oils and essences and without refined sugars, produced using minimal heat. Pana Chocolate is full of antioxidants, amino acids, vitamins and minerals, without preservatives, that's free from gluten, dairy and soy. Chocolate that's rich, smooth and velvety. Desserts that are artfully handcrafted and an experience for your tastebuds. One bite. The whole bar. A guilty pleasure that's not so guilty after all.